We are now accepting applicants for our online traditional training in Tibetan Medicine starting February 12th, 2019! Our program is the most in-depth training in traditional Tibetan Medicine in the West, culminating with the opportunity to do an internship at the Tso Ngon Traditional Tibetan Hospital in Qinghai, China. 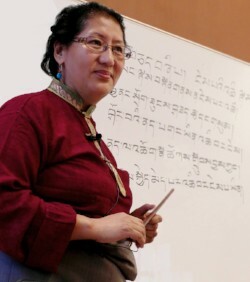 Led online by Dr. Phuntsog Wangmo, students learn directly from the Gyud Zhi, the main traditional text used in Tibet and India at all the major Tibetan Medical colleges. Topics include general healthcare, woman’s health, pediatrics, toxicology, injuries, provocations, geriatrics, and fertility. Twice a year students come to our campus in Conway, MA for intensives which include practical training in Tibetan Kunye External Therapies as well as traditional diagnostic methods such as pulse reading and urine analysis. We invite you to learn more about our program and apply today!